I feel like I've jumped the gun a little by launching into blogging every James Bond movie with Dr. No. True, it was the first Bond film, but it was not the first attempt at a Bond film. In 1958 Ian Fleming got together with a group of people, including writer and director Kevin McClory, to develop a Bond film. Rather than adapt one of Fleming's existing novels, they started work on an original story called Thunderball that was to be the first Bond film. Then for some reason in 1961 Fleming decided to publish the "novelization" of the story as the 9th Bond novel without crediting McClory or any other writer who helped develop the screenplay. A legal fight immediately ensued that would tie up the rights for years. Dr. No was then chosen for the first film, according to IMDB Trivia because it had a straightforward plot with only one location (Jamaica). But who would direct it? 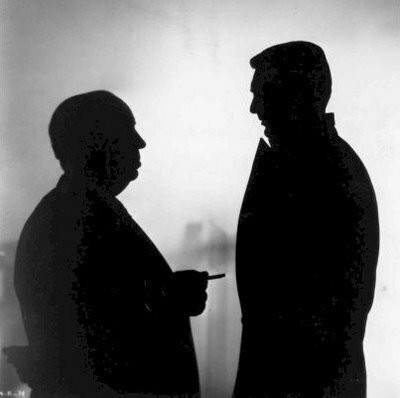 According to a recently discovered telegram from Fleming, he originally wanted Alfred Hitchcock with Cary Grant in the role of Bond. One imagines it playing like a sequel to North by Northwest. Unfortunately or fortunately, Vertigo's disappointing box office numbers turned the studio against the idea. Of course Fleming also wanted Noel Coward to play Dr. No. Fleming was a bit eccentric. Roger Moore was also considered for the part of Bond originally, though he says in his autobiography that he wasn't approached to play the part until after Connery's second and "final" departure. Eventually Terrence Young was chosen as the director and Connery was chosen as Bond, largely due to the persuasions of producer Albert Broccoli's wife Dana. Fleming didn't like him at first (he repeatedly described Bond in his novels as looking like Hoagy Carmichael) but came around, even writing Bond to have some Scottish ancestry in later novels as a tribute to Connery. Of course before any of this happened there was the 1954 TV Casino Royale adaption. You can view that in its entirety on YouTube if you're so inclined. It's got Peter Lorre in it. But I think that brings us up-to-date.